“The Nutcracker” is a famous romantic ballet that celebrates the magic of Christmas. This ballet is set to music written by Peter Tchaikovsky. It’s the story of a young girl named Clara. On Christmas Eve Clara dreams of a Nutcracker Prince and their magical journey to the Land of Sweets. Read more about the The Nutcracker Ballet below. The first half of Act I opens with a big festive party on Christmas Eve which is hosted by the parents of a young girl named Clara. At the party Clara’s mysterious Uncle Drosselmeyer gives her a magical nutcracker. Clara is very excited to receive such a wonderful gift. After bedtime when all the guests have gone back home, Clara sneaks back downstairs to visit her nutcracker. She falls asleep by the Christmas tree. Clara dreams her nutcracker comes to life and turns into a handsome prince. In the second half of Act I, together Clara and the Nutcracker Prince with his army of solders battle and defeat an evil Mouse King and his troops. To celebrate the defeat of the Mouse King, Clara and the Nutcracker Prince head off on a magic journey. Their first stop is to meet the Snow Queen who along with her court, dances for Clara and the Nutcracker Prince. In Act II Clara and the Nutcracker Prince travel to the Land of Sweets and meet the Sugar Plum Fairy. A big celebration is held in honor of Clara, the girl who helped to defeat the evil Mouse King. Many different types of dancers perform for Clara. The ballet ends with Clara waking up back home on Christmas morning to her loving family. Creating a ballet takes lots of people working together. A famous Russian composer named Peter Tchaikovsky wrote the music to the “The Nutcracker”. The music in “The Nutcracker” is Romantic style. The Romantic Period of history occurred in Europe during the 1800s. Writers and artists of the Romantic Period of history sought to convey deep emotions and the awe-inspiring beauty of nature in their works. The choreographers Marius Petipa and Lev Ivanov designed the dances in the ballet. The written story or libretto of this ballet is based on the story “The Nutcracker and the Mouse King” by E.T.A. Hoffman. As a boy growing up in Russia during 1800s, Tchaikovsky loved music and excelled at his piano lessons. His parents, however, sent him away to college to study to be a civil servant, thinking it would be a more stable career than a musician. Tchaikovsky graduated and became a civil servant, but eventually and against the wishes of his parents, he decided to pursue his love of music and enrolled in music school. He went on to become very famous composer during his time, and his work is still performed today. “The Nutcracker” as well as his two other ballets “Swan Lake” and “The Sleeping Beauty” are still performed around the world today. Going to The Nutcracker ballet is a great Christmas time activity. It is something the whole family will enjoy. During the holiday season many ballet companies and ballet schools perform The Nutcracker. You will find there are all sorts of performances out there of The Nutcracker of varying lengths and price points. Take some time reading about them online before you make your choice. Buy your tickets early as they often sell out. Before attending a live performance you will find kids enjoy it much more if they know the story ahead of time. They can then follow the plot much better. You can tell them the story or better yet watch 'Prima Princessa Presents The Nutcracker' which is an hour long show that had a condensed professional version of 'The Nutcracker' narrated by a cartoon ballerina so children can follow the plot. In between acts children get to practice the ballet steps along with Prima Princessa and ballet students too! You can visit Prima Princessa's List of Ballet Schools in the USA to look up performances. It is easily searchable as it is organized by state. You can also look up major performances by checking out Prima Princessa's List of Ballet Companies. It is great fun to throw a Nutcracker ballet party. Kids can come as the Sugar Plum fairy. Have fun decorating cookies and watching and dancing to 'Prima Princessa Presents The Nutcracker'. Give out Nutcracker as party favors! 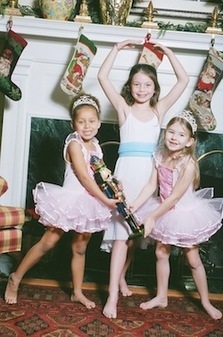 Freeze Dancing is another great Nutcracker party activity! Visit our Christmas cookie page for tips on fun treats to make for and with kids at your Nutcracker Ballet party. 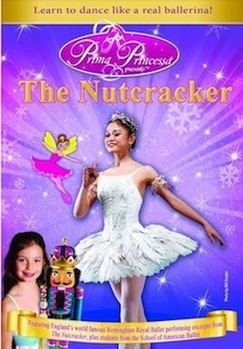 "Prima Princessa Presents The Nutcracker" makes an especially great gifts for girls for the Christmas season. It is for ages 3-6 and features reall live ballet and ballet lessons too! You will love this The Nutcracker for kids show! It stars The Birmingham Royal Ballet of London, students from the School of American Ballet, an animated fairy ballerina and young preschool Sugar Plum Fairies!